Bring the water to a boil. Cut the stem portion of the kale out of each leaf. Set aside. When the water is boiling, blanch the whole kale or turnip leaves for 1 minute. Remove, quickly rinse and drain. Blanch the whole kale stems for 1 1/2 minutes. Remove, rinse and drain. Blanche the carrot strips for 1 1/2 to 2 minutes, remove, rinse and drain. Take a bamboo sushi mat, set it on a counter or cutting board. Place a sheet of sushi nori on the mat with the rough, dull side facing up. 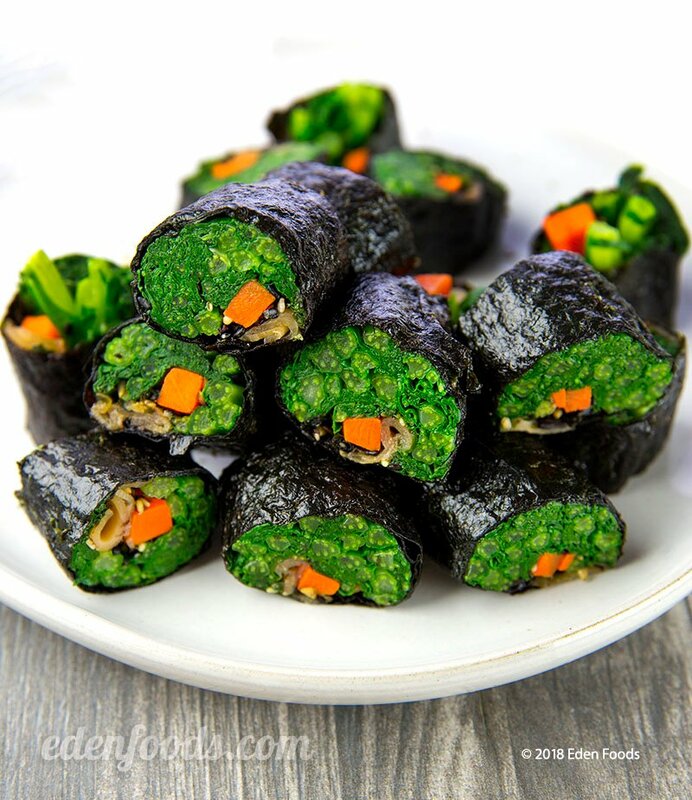 Take three whole kale leaves, one or two stems and one or two carrot strips, and place them on the nori so that they cover the bottom half of the sheet of nori. Evenly spread 1 teaspoon of chopped ginger slices or daikon in a straight line across the center of the kale leaves, covering the width. Sprinkle 1 teaspoon of Eden Shake across the width of the kale. Roll the mat up in a jelly roll fashion, just as you would if making rice sushi, pressing firmly with your fingers. Pull the mat back toward you, as you roll, so as not to roll the mat up inside with the vegetables. When completely rolled up, wrap the mat completely around the nori roll and squeeze gently to remove excess liquid. Remove the mat and place the roll on the cutting board. First cut the roll in half. Then cut each half in half and each quarter in half. You should now have 8 slices of vegetable sushi. Repeat the above steps until all ingredients have been used. Arrange attractively on a serving platter. Carrots, cut in long strips and blanched can be placed on top of the kale leaves before rolling for a more colorful effect.